Ken Rogoff’s FT article, and my and Paul Krugman’s comments on it, have generated an interesting set of additional posts, which I hope to discuss further. However before doing so I want to look forward to the kind of recovery the UK might experience. As the UK recovery appears to gather pace, the crucial variable to watch is labour productivity. I have talked about the UK productivity puzzle a number of times. The data suggests that productivity has declined with output, yet there is little evidence of labour hoarding. (For a range of views on the UK productivity puzzle, see this post from Bruegel. On US/UK comparisons, see also Karl Smith here.) The worry is therefore that as the recovery in demand gets going, demand starts to exceed supply, and we get inflation. This in turn will lead the Bank of England to raise interest rates, and the recovery will be short lived. The alternative scenario is that as demand picks up, so does productivity, and inflation remains subdued. MPC member Ben Broadbent, in an interesting discussion, suggests that this uncertainty over how productivity will behave provides a clear justification for the Bank’s forward guidance. If productivity does pick up with the recovery, unemployment will remain above the Bank’s 7% threshold, and it will be clear that interest rates will not rise, even if output is growing rapidly. If this does happen, there are two ‘off the shelf’ explanations. The first is that there really has been substantial labour hoarding, despite what the surveys tell us. The second is that the decline in labour productivity is all about factor substitution: weak real wage growth generated by unemployment and an unusually flexible labour market has led firms to substitute labour for capital. If real wage growth resumes as the economy recovers, this process will go into reverse, and labour productivity will catch up its lost ground. Ben Broadbent remains unconvinced that either story provides anything like a full explanation of the UK’s productivity puzzle. (If you want to know why, read the technical appendix to his speech.) So what unconventional story could we tell? The obvious place to look is where macroeconomics is weak, and where the recession was unusual, which is the influence of finance. The idea that Broadbent explores is that productivity growth depends on the reallocation of resources from low to high productivity activities, and that the availability of finance is important in facilitating this. If, because of continuing problems with UK banks, this finance is not forthcoming, productivity growth will slow. The innovative start-up will not get the finance it needs, while the inefficient existing firm will be allowed to hobble on, perhaps because the bank does not want to write off their loans. The trouble with this explanation is that it is very difficult to find evidence beyond the anecdotal that will either back it up or disprove it. One interesting finding that Broadbent presents is contained in the chart below. It plots the variance of real prices, across 29 sectors of the economy, compared with their pre-crisis trends. The large increase in variance since the crisis (particularly compared to the recession of 1992) might indicate that resources have not been flowing to high profitability/productivity areas, leading to a reduction in aggregate productivity. If this variance was entirely due to differences in demand across sectors, Broadbent calculates this price dispersion could be consistent with an aggregate productivity loss of 3-4%. Broadbent presents two other pieces of evidence. First, there has been a surprisingly low level of firm exits in this recession. (See, for example, Tim Harford here.) Second, investment does not seem to have been as responsive to changes in profitability at the firm or industry level in the UK since the recession compared to either pre-recession periods, or post-recession in the US. The potential importance of finance in influencing supply is highlighted in a recent study of UK exporters. Holger Görg and Marina-Eliza Spaliara look at UK firms that exited from export markets during the Global Crisis. Their evidence points to the importance of financial factors. Firms that exited were more heavily indebted, less liquid, and faced higher firm-specific interest rates. This might help explain why the impact of the large real depreciation in sterling in 2008 on aggregate net exports has so far been disappointing. In addition, firms that are unable to expand into new markets because they cannot get the finance to pay for the associated set-up costs will also fail to benefit from any economies of scale that expansion could have brought, and again productivity will suffer. If you buy this finance based explanation for at least some of the UK productivity puzzle, then an unresolved question is what this implies for productivity as the recovery progresses. There are two reasons for thinking that these negative effects will not be permanent, aside from the general implausibility of such a large permanent negative hit to supply. First, once banks balance sheets have been restored, normal patterns of lending should resume, and new innovative firms will get their chance. (In addition some existing firms may be able to use cumulated profits to bypass the banking sector and self-finance productivity enhancing expansion.) Second, bank behaviour may also be endogenous: what looks to banks too risky when the economy is flat looks much less so when the recovery is underway. It is this kind of thinking that has encouraged innovations like the Bank of England’s Funding for Lending scheme. Unfortunately the more recent Help to Buy scheme could actually be unhelpful in this respect. If it diverts any new bank lending from firms to households, it may reduce the speed at which credit rationing of firms is reduced, which may in turn reduce the speed at which UK productivity recovers. But Help to Buy was always about winning elections rather than building a sustainable recovery. Thanks - text corrected. Apologies to Ben. "Or to put it another way, those who moan that education standards have declined in Britain are correct, according to the OECD. This would help to explain why, since the crash and great recession of 2008, unemployment in Britain has risen much more among younger than older people." "The key point for productivity here may be that engineering a recovery from postmodern recessions is much harder than engineering a recovery from a recession more or less deliberately inflicted by the Fed; and as a result the recoveries tend to be long flat U’s rather than the V-shaped recoveries of yore. And to the extent that firms know this, they have less reason to hoard labor; they’re not going to need those laid-off workers for a long time." "German growth hasn’t been great, one quarter notwithstanding; but it avoided US-style mass layoffs even when it was slumping badly. Part of the explanation is the Kurzarbeit program of work-sharing; also, Germany’s labor laws and its strong unions have led to a situation in which workers aren’t treated as much as variable costs as they are here." Are the UK's labour laws just between the US and Germany's? (From a different Anon.) I agree but would go further. A problem with most discussions of UK productivity since 2008 is that they concentrate on comparing the the UK to the US. However a previous post by Prof. Wren-Lewis (I can't find the refernce offhand) had a graph with several other EU countries as well as with the US. The other EU countries looked much more like the UK. Therefore thefirst step in testing any proposed explanations for the UK productivity puzzle should be to check not only that the proposed causes do not exist in the US, but also that they do exist in those EU countries that have had a similar experience to the UK . You claim that “once banks’ balance sheets have been restored, normal patterns of lending should resume..”. That is debatable. If bank balance sheets are rectified in say two years’ time, my guess is that banks will still have memories of the crunch, and will maintain conservative lending practices for at least a further five years. Of course in fifteen years’ time everyone will have forgotten the crunch, and history will repeat itself, unless we get our act together. 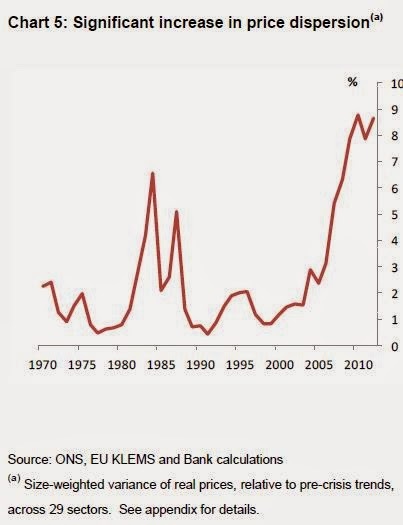 Also, given that bank assets and liabilities are a whapping TEN TIMES as large nowadays relative to GDP as compared to the century leading up to 1970, it could well be argued that a big REDUCTION in bank lending is in order. As to countering the deflationary effect of any such reduction, that’s easy: spend more monetary base into the private sector. Private sector entities would then have a larger stock of money and thus would not NEED to borrow so much. A third off-the-shelf explanation: suppose goods are non-rival in consumption. For example: it takes labour to produce a new computer program, or new music, but additional copies of the program/music can be produced at zero marginal cost. GDP is measured as the number of copies sold. In a recession, fewer copies of each new program/music are sold, so measured productivity falls. But it's simply a movement along the production function. It's not a shift in the production function. Nor is it a point off the production function like labour hoarding. I have no empirical evidence for this hypothesis, except casual observation that modern economies seem to be producing more of these sorts of goods. Hi-tech gizmos seem to be a bit like this. nice post meh, It reminds me of an equally interesting blog on my reading list which is Daniel's Dating And Personal Development Blog . Skidelsky's blog Oct. 7, 2013 'Underreported Underemployment' looks at the labour market in the UK. Skidelsky looks at the number of jobs filled by those not skilled in that area, the underemployment in terms of hours: all of these factors must hit productivity. And Stiglitz in his 'Five Years in Limbo' defines the recession as not two quarters of economic decline but failure to get back to 2008 level of GDP, which sounds like a good definition to me. Hugh - thanks for this. I had not even realised Jonathan had a blog, although I think he might have mentioned it when we last met. It is an interesting argument. 1. High propensity to import. 2. Lack of investment response. The owners of capital can invest abroad to meet an increase in domestic demand. 3. Narrowing output gap. The capital drain evaporates the output gap during the recovery phase, leaving less headroom for expansion. 4. Government revenue less than expected. Capital drain is associated with falling government revenues through tax losses as firms outsource abroad. 5. Wage stagnation reducing demand. Real wages fall in line with the decline in the marginal product of labour. 6. Unforgiving bond markets. Bond markets implicitly understand the globalization process and consequently take a dim view of government debt - especially where a country is not blessed with its own currency. While fiscal stimulus is less effective as part of it dissipates globally, monetary policy is now easier for a similar reason - inflationary consequences are also globally transmitted - lessening domestic impacts. Small wonder at the recent preferrence for monetary stimulus. With many prices determined internationally, inflation is much less of a risk. Roll the presses! Or less productive firms that should have failed are able to survive due to the pick up in demand, consequently continuing to constrain the flow of capital to more productive firms (I believe the Japanese lost decade provides evidence of this). You also overlook the number of potentially viable firms that could have entered the market in the last 5 years were the resources available. You can't just make the assumption that there is a conveyor belt of them that just stops whilst the finance is unavailable and then restarts once growth picks up.